As 1440p gaming is getting more and more popular, so is the demand for a faster graphics card. Sadly, most of the high-end graphics cards, are out of reach of majority gamers where their budgets are mediocre. A spot for the new mid-range card was empty until Nvidia announced the RTX 2060. The RTX 2060 brings GTX 1080 level of performance and replaces the GTX 1060 which brought GTX 980 level of performance to the masses. This sounds like yesterday’s dream but is finally a reality. 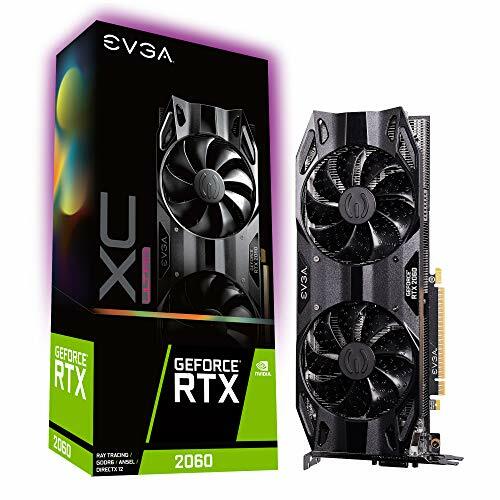 We have in front of you the best RTX 2060 cards available to meet all of your gaming needs providing a great experience. EVGA just cannot stop making excellent cards and the RTX 2060 XC Ultra easily secures the top spot. The EVGA RTX 2060 is the fastest one in this bunch with a core clock speed of 1830 MHz. Otherwise, you can push it further than the 2 GHz mark. It is a standard size GPU and should fit perfectly in all standard sized cases. It comes with a dual-link DVI port, an HDMI 2.0b port, and two Display Port 1.4 outputs. The card fulfills its power requirements with a single 8 pin connector with a maximum recorded power consumption of 208 watts. We observed stable core clocks and the temperatures were roaming around 70 degrees during the stress test. The fans have improved a lot from the previous EVGA graphics cards and these ones are much more aggressive. The card is cooled by 2 fans that do not spin if the card is idling or under a minor load. These fans run over 3 copper heat pipes with a fin array heat sink. The card works nicely with EVGA’s Precision XOC in terms of overclocking and lighting control. All in all, our recommendation is to choose the EVGA RTX 2060 XC Ultra first over any other card. It will keep you well satisfied with gaming at 1440p or even 4K at high settings. Asus makes some of the best cards around. The Asus ROG Strix 2060 is no exception. It is crowned by us as the most pleasing looking RTX 2060 in the market right now. It has RGB lights which can be controlled by Asus Aura Sync software according to your needs. This is also the beefiest card in terms of space consumption taking up more than 2 slots for accommodation and measures at a substantially long 11.81 inches so keep in mind when fitting it in your case. It can comfortably clock to 1830 MHz and you can easily push it to the 2 GHz territory with a bit of luck. The performance of this graphics card was almost the same as the EVGA model, but we noticed much cooler results, which was expected from such a beefy cooler along with three fans. We observed a maximum power consumption of 175 watts on this graphics card. The Asus RTX 2060 is paired with two HDMI 2.0b and 2 Display Port 1.4 connections. 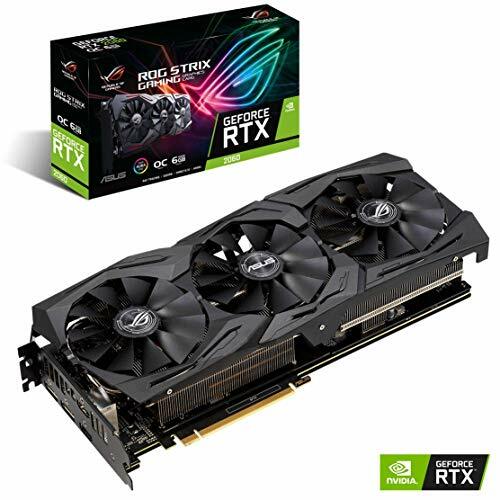 Even though this card is quite large and you might have trouble fitting it in your case but you can not go wrong with the RTX 2060 chip under the Asus ROG Strix cooler, especially if it was your only choice. It keeps the card breezing through long gaming sessions with its massive cooler, great OC capabilities, and flashy aesthetics, all the while keeping the card quiet. 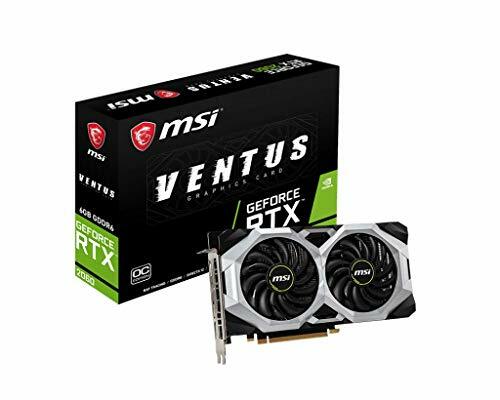 MSI VENTUS RTX 2060 OC features a simplistic design yet gives a very nice and clean look. For anyone looking to pair this with a black and white theme will feel right at home with this card. Design-wise, this is a solid choice for neutral builders as well and it also has a beautiful black back plate with white stripes and MSI logo. It runs cool and quiet and can operate silently without the fans spinning under idle or light load. This card is paired with three DP 1.4 ports and an HDMI 2.0b port for output and has a total power consumption of 150 watts. It clocks at a smooth 1710 MHz while being actively cooled by 4 copper heat pipes and premium thermal compound. This graphics card is quite leaner than the ROG Strix edition and achieved lower core clocks, which was expected. The temperature of this card was roaming around 65-67 degrees, which is fine by all standards. This puts the MSI VENTUS at a strong position by being an overall well-rounded package by delivering top-notch performance and looking good while doing it. It gets a solid yes from us as being both uncompromising while being fairly lightweight and easy to build with. 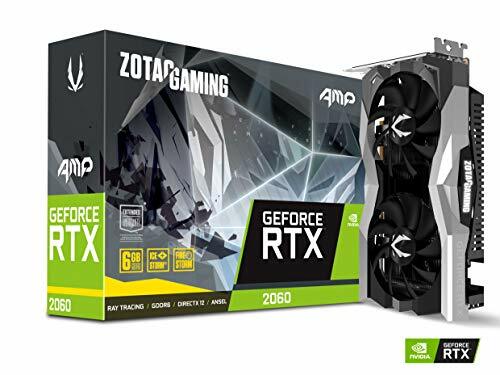 If you are a tiny PC builder who does not want to compromise performance over form factor, then you can happily go along with the ZOTAC RTX 2060 AMP. This card is much smaller than the other cards and ZOTAC claims it can fit easily in 99% of computer cases out there. The card is only 8.3 inches long while maintaining a dual fan setup instead of one as most ITX cards do. Even if it’s not a true ITX card which it needs to be around 6 inches in length to be classified as it certainly is smaller than every standard card while having all the features of the larger ones. It is powered by the 8 pin connector and a maximum power consumption of 187 watts was recorded. The Zotac RTX 2060 AMP is equipped with three DP 1.4 ports and an HDMI 2.0b ports. Despite having such a small size, this graphics card put up quite a show and its performance was better than the MSI model with a slightly higher temperature. For small system builders, the ZOTAC RTX 2060 AMP is an absolute beauty. It is tiny in contrast to any other RTX 2060 out there and it does all of this with 2 fans instead of 1 as most ITX cards do due to the severe limitations in their size. The ZOTAC card is the only clear choice if you have a small case and don’t want your card to suffer from heat and lack of space. RTX 2060: Ray Tracing For $350, Worth It?